Another series of paperbacks on the Land of the Giants TV series. 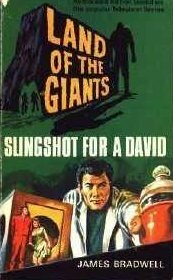 This paperback is titled, "Slingshot for a David". Written by author James Bradwell & published by World Distributors in 1969. This is a tough paperback to find in the series.